SEO on YouTube may be one of the most neglected things there is. Subscribers, shares, and comments which build a community are all important, but at the bottom of everything done online is SEO. YouTube SEO is similar to how you build a website’s SEO, with some differences. One difference you won’t find, however, is that better ranking equals better chances of making money. Let’s look at those differences so that you can better monetize your videos, whether it’s for monetization right on YouTube, or if you’re using video to support a monetized website. YouTube is tracking every single thing about your videos that it can, and using that data to rank them. One of the most important, and seldom discussed, is Watch Time. Think of it as bounce rate for video. Videos with longer watch time, and a higher percentage of their video being watched, rank better. Your YouTube Analytics will show you your Watch Time stats. Take this information and apply it to your videos. Are there slow spots which cause people to click away? Should you stop putting in linking out Annotations mid-video. Pay attention to trends which hurt your Watch Time. Your editing of your video will determine how successful they are. If what you’re creating doesn’t match with what the title promises you will lose viewers early. The keywords you’re using can be the wrong ones for your audience. Sure, you’re ranking well for something, and bringing in viewers, but are they the people who actually want to watch you? This could explain why you have people clicking away quickly as they may have wanted information when you created a funny video, or the other way around! This may be the whole key to your YouTube SEO. It is not a one-time only consideration, it is an ‘every video you upload’ consideration. Keep learning, keep adjusting, and you will one day be getting the absolute most from your video SEO. Ok, you understand YouTube’s most unique SEO component, Watch Time, now let’s look at an old familiar topic: keyword planning. You’re going to want to do the same planning here as you would on your website. Look for, and use, words which your desired viewers are looking for. The top 2 are exactly what I’m looking for. The bottom one is not. 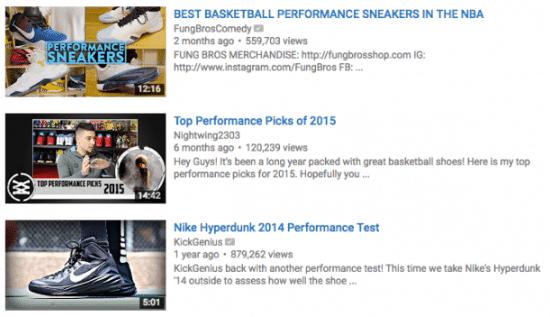 If that video was trying to optimize for ‘basketball performance shoes’ they may want to reconsider. They are featuring one shoe, and a specific model. A better approach may be to try for ‘hyperdunk review’ or ‘budget performance basketball shoe’ instead of this broad topic the video doesn’t fit in. As always, be sure to use Google Adwords, and any other keyword search, to figure out what will work for you. Doing a competition keyword search, where you test your chosen keywords to see what content comes up, is also a wise investment of your time. Where do we put these keywords? Video title, instead of the page title. Video description, instead of the meta description. Video tags, instead of alt tags. Video script, instead of article text. Placing your keywords in each of these places is a key component of making your keywords work. Do not forget the last point as you can easily create a transcript and upload it to your videos. Read the titles and description of videos which use the same keywords as you. There’s a lot to learn there, and you can borrow some of these ideas for your own keyword use. The 1st sentence is what displays in search results. Fit in a call to action to watch, or at least a compelling reason, with the person searching for it in mind. In my search above, would they be better off using a first sentence that goes ‘See why these shoes are so comfy and great for shopping in,’ or ‘See why these shoes are great for hooping in all day, in outdoor or indoor courts.’ If you can’t see which is the right first sentence, you’re in the wrong business. Keyword stuffing is as frowned upon here as it is in website SEO. Using secondary keywords, and synonyms, is still valid though. Don’t be afraid to link out to your website, or blog, to give people more information. 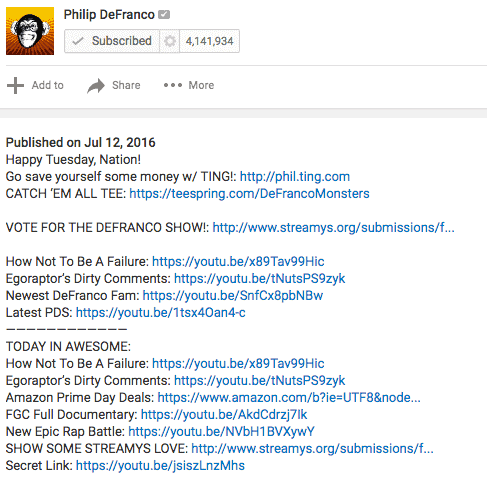 Top YouTubers like Philip DeFranco include links in the description and mention it to their viewers. Video creators who do this are seen as a resource with useful information, and that can keep people coming back to watch you over and over. Ok, let’s be real for a second: YouTube has never flat out said that views count towards SEO. But come on. Do you ever see a video with millions of views ranking poorly? SEO is all about search engines reading signs that a video is worth ranking higher than another, and popularity has always been a factor in one way or another: Watch Time certainly confirms this. So you need more views to get better SEO, but you need better SEO to get more views… Ouch. Embed your videos on your website. Push your videos on social media. Link videos to one another to keep people watching. Annotations are great for this. Create ‘best of’ videos which link out to the original video. Have ‘thank you’ videos when you hit milestones. Who wouldn’t want to watch a few more of their videos to see what they’re about after watching that? Try to get your videos linked to from websites which are related to your video content. Use a call to action to view the video as the number of views it gets on that website impacts SEO. You’ll use the same outreach tactics, getting in touch with webmasters any way you know how, to make this happen. Email marketing, with your videos embedded and a push to embed it on their websites as well. Press releases being sent to the right people. Putting video on landing pages which are link targets already. Getting in touch with viral influencers via social media. As you’ve probably figured out by now, YouTube SEO takes many of the aspects of website SEO and puts a spin on them. Your video SEO involves every aspect of what you do online, just like with your website. Have a complete plan, which touches everything you do online, and your videos will rise in the search engine rankings. Author’s Bio: Matthew is the writer for Devumi.com’s weekly blog. This post was written by a Featured Contributor. If you're interested in writing an amazing case study, guide or any SEO/Marketing related blog post READ THIS. There is a relationship between keyword-rich video tags and rankings. This could represent the fact that YouTube can now understand video content without the help of metadata. Video content is very important as you allready describe in this article.Thanks for your post and keep share. Thanks for tips Sir. Outbound links to authority websites are definitely a must even outside of You tube. 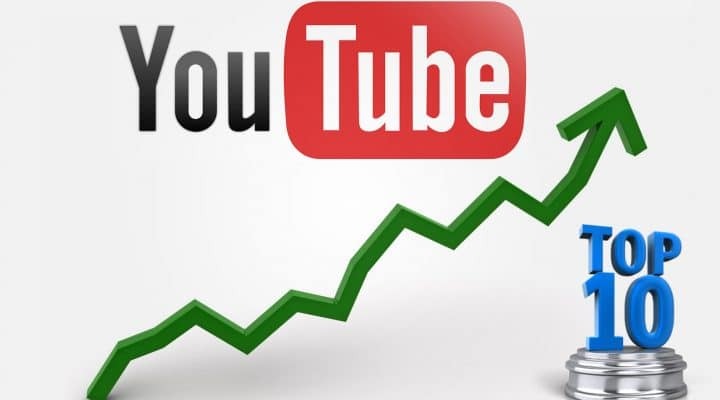 Article is more helpful for beginner you tube marketer…… Thanks for your post and keep share. Thank you for this clear and helpful tutorial. A question: if I want to rank a YouTube video specifically on Google… should I focus only on engagement (retention views, comments, social media shares, ecc.) or should I add also classic backlinks (anchor text to the video url, from other sites)? I still don’t understand If the last ones are almost useless or actually useful. They’re useful, definitely not useless. But the engagement and views help a lot in Youtube, much more than in a blog/website. Do you have any idea of the availability of a tool or a webservice to find & evaluate backlinks of our YouTube Video ? (as well as for Vimeo & DalilyMotion videos). And the same question for the competitors YouTube Vidéo ? Since many weeks I did a long investigation, but except Quora, I didn’t find anything. And all the YouTube “Experts” doesn’t mention this point and this kind of tool. Never ! For a lot of reasons, we need to know where our video are shared or included into a playlist from other YouTube Channels. So, I think and I’m convinced my question and my investigations are legitimate. Thank you for your useful answers. Great article, Youtube seo can be tricky in my opinion. You broke it down really well. I think i am too quick to name something on youtube that sounds catchy to me, but when in fact it is never searched for. So I need to realize that naming things for what people are looking for in the end is going to give better results. 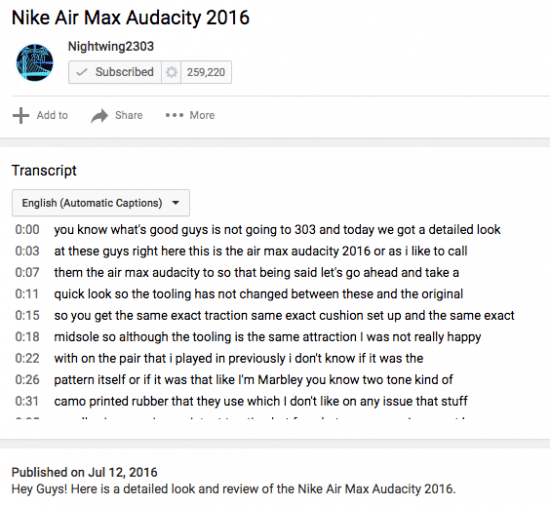 Yes – Enabling CC – Closed Captioning and editing the transcript is smart. You can actually add your primary keywords if you forgot to use them while you were recording. And – You can remove any ‘Uh…’ ‘umm..’ you might have said during your narration. YEP, GOOD TACTICS TO USE! OUTBOUND LINKS TO AUTHORITY SITES HELPS BOOST RANKINGS. Nice tips man. Outbound links to authority websites are definitely a must even outside of Youtube. Should these OUTBOUND LINKS BE “DOFOLLOW” OR “NOFOLLOW”? If it’s in YT you don’t have the control but for your websites I leave them Do follow.